Travel with Kevin and Ruth! : We struck it rich, and now we're off to Alaska! A little late posting... the following is based on our Thursday July 19th activities! We were up early Thursday morning because we had an appointment to find some gold! We arrived at Klondike Experience at 8:15am, ready for the 8:30am departure to Bonanza Creek, the area that sparked the Yukon goldrush of 1898. We met our guide Sandra and then our minibus picked up 5 other couples at various hotels around Dawson City, and then we did a short tour of the city itself before heading out to the gold claims area. Our first stop was Dredge Number 4, the largest of many dredges that mined for gold in both Yukon and Alaska. This huge machine was built in 1909, and it was operated for 46 years! During that 46 years, Dredge #4 recovered 8 metric tons of gold. During top production, almost 800 ounces were cleaned out every 3 to 4 days. Sandra has been living here since the 1980's and is extremely knowledgeable about the area. She even knew some of "the oldtimers"... men who operated the dredges. There are a lot of different mining methods in use today. Some small claims are still family operated, and they will produce small amounts of gold for years to come. Enough to make a living on. Other claims are mined with large equipment, with the goal of getting as much gold out in as short a time as possible. There is even one public claim where anybody can go with a gold pan and see if they can strike paydirt! Site of the original "Discovery Claim". Next stop was The Discovery Claim at Bonanza Creek. This is where three men, George Carmack, Skookum Jim, and Dawson Charlie were searching a creek in August of 1896 and they found so much gold you could almost scoop it right out of the creek. Word got out to the nearby town of 40 Mile, and the next day there was nobody left in town! Everybody was up trying to stake claims at Bonanza Creek. The spot where the Yukon Gold Rush all began. 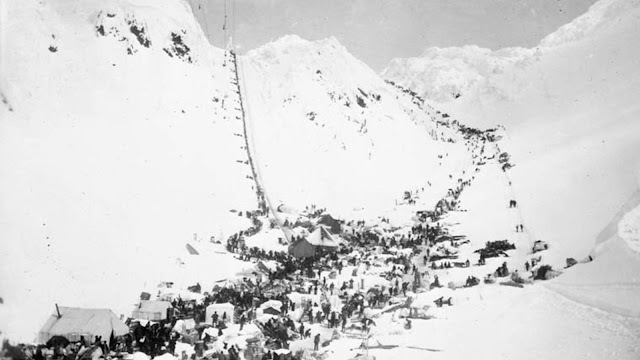 The famous 1898 photo of men trying to get through the Chilkoot Pass on their way to what was to become Dawson City, Yukon. It took two years before word spread around North America and gold fever built quickly. In 1898 over 1 million people made plans to come to the Yukon. They figure that 100,000 actually set off, and 30,000 managed to complete the journey. But, very few of them struck gold. The rich claims had already been staked. More people made good money from selling overpriced goods to the miners than they did from mining gold. Then, we were off to Claim 33. This claim has been exhausted, and now it's a tourist stop where they teach you how to pan for gold. They give you a pan with some dirt in it, but the dirt has been "salted", with everyone guaranteed to find gold in their pan. People learning how to pan for gold. Lots of old stuff to look at! Ruth, outside the old jail cell. Imagine an outdoor jail cell?! I bet they didn't have any Deep Woods Off for you either! In fact, there's a funny joke around here that the miners back then could only work one handed. The other hand was busy swatting mosquitoes! Ruth and I put our gold in the same little jar. There's probably $10 worth of gold there! I had done a lot of reading on the internet about gold panning techniques, and I think I'd be really good at it! Not that it was a race, but I was the first one to finish with the clean gold left lying in the bottom of the pan. Sandra even said "yep, you've got the right idea!" Many people who go to the public claim still find gold. But only in small enough quantities that you might make $20 or $30 for 8 solid hours of work! With our gold in hand, Sandra drove us all back to Dawson City. We were gone for about three and a half hours, and it included a very knowledgeable guide, and transportation, so not bad value for the $50 per person. Huge thanks to Yukon Tourism for supporting our gold mining adventure so that we can show you what this part of the Yukon is all about. They've got more adventures coming up for us over the next couple of weeks or so, so stay tuned! We had some lunch, and then did some shopping. We've totally enjoyed Dawson City, but we've got to move on! We figured we would be better off crossing the ferry mid afternoon, and so we set off on the Top of the World highway towards the Alaska border. We drove about 53 kms (31 miles) and found a great spot to overnight. So far, the Top of the World highway is in quite a bit better condition than the Dempster Highway was. Around dinner time, another vehicle pulled in... one of those German Unimog style of RVs. We had actually seen this vehicle in Dawson City, and had noticed the "Namibia" decal on the back of it. Having spent two months in Namibia in late 2013, we were curious enough to go say hello and we invited Martin and Christa over for a glass of cheap wine. They accepted, and we spent an hour chatting. They are originally from Austria, but actually live in Windhoek, Namibia. They're on a long term trip though, having had their vehicle shipped to South America, and then driven north from there. Today we are off to Alaska. Not spending much time there though... it's mostly just to take a different route back towards Whitehorse. What an adventure your on! When I took a 3 1/2 month trip in your neck of the woods about 10 years ago or so one place I stopped at was Hyder Alaska. It's a must if your ever out that way. From the bear feeding observation platform above the river to the Salmon Glacier(awesome). Plus the little bar in town is pretty darn famous. I found you guys as I followed RV Sue. I like that you folks are friendly and full of adventure!!! Sounds like you would have had a great trip having given yourself lots of time. We are hoping to stop in Hyder, Alaska on our way back south next month. I think Martin from Nambia was in the Cactus Country RV Resort in Vail, AZ earlier this year. He was waiting on a part for his RV and I chatted with him for a while. Nice guy, but didn't meet his wife wife. Small world, isn't it? If you see him again, ask if he was in the Tucson area in April or May. Enjoying you trip and you have been tracing our trip to Alaska, but in reverse order. Have a great time. It could very well be! I know that they were waiting for delivery on a windshield at some point when they were coming up through the States. It may be possible that we will see them again today, if so I will try to remember and ask them if we see them. We are glad to hear that you are enjoying our trip. Unfortunately on this particular trip we are spending very little time in Alaska. We will have to do a separate trip up here just for Alaska as there is lots to see and do and of course we love to take our time, so on this trip we just wouldn't have time to do it justice. I'm so confused...Is this the blog for July 19th? or 18th? I thought you were in Chicken, Alaska but I see you are in Tok….south of Chicken. Did I miss blog post somewhere? Ooops you have two blog post dated 19th...what happened on Friday 20th? This is the blog post for Thursday, July 19th. Originally Kevin had the wrong month and date on the post and when you mentioned this he changed it. Because the post went up last night our time, it came up on Blogger dated Saturday, July 21st because Blogger goes by Eastern Standard Time, so no you haven't missed a post. Kevin is working on yesterday's post now and it will be up shortly and it will be our post from yesterday, Friday, July 20th. We panned at one of those tourist places while in Fairbanks, and we both scored gold! Jimmy found the most ... prob like yours ... maybe 10 bucks worth. It was fun. I got my $10 worth of gold in a jar at the museum in Watson Lake. Lol! Enjoy your windfall! Lovely scenery along the way.